Lucknow University Admission 2019: Students who are interested to take admission in the UG and PG program in the Lucknow University is required to know that the university soon releases the application form regarding this courses on the official website i.e. lkouniv.ac.in. Latest Update: Lucknow University Admission test schedule and Notification Released!! The university organizes the separate exam of the courses provides by the university in the field of science, commerce, law, arts, and the other courses also. So students who are preparing for this are able to get the complete information regarding the Lucknow University 2019 Admission. Those candidates who want to take admission in the BTech program under the Lucknow university they will get the admission on the basis of the UPSEE 2019 score card. In this post, we are mentioning here all the information regarding the Lucknow University Admission. Here we are mentioning some of the important details regarding the Lucknow University 2019 Exam Date of the UG and the PG courses. We will provide the official date after it will release officially by the university on the official site lkouniv.ac.in. Event Dates for UG Management Dates for B.El.Ed. Here we are mentioning some of the important details regarding the Lucknow University Eligibility. Students note that those who fulfill the eligibility criteria only they will allow sitting at the examination. Nationality: All the Indian students, as well as the foreign candidates, are eligible for the exam. But the foreign students should have the knowledge of the Hindi or English languages. Age Criteria: The minimum age criteria is 22 years until 31st July. For the UG and PG program the LKo University Application Form will be available from the April 1st/ last week. While filling the application form candidates required to upload the document such as marksheet (10th, 12th), photo ID proof, aadhaar card, income certificate, caste certificate, scan photographs, and the image. The last date of filling the application form is May 2nd/ last week 2019 for UG and PG. The application form will accept only in the case if the candidates successfully submitted the application fees. The Lucknow University Entrance Exam Fees is given below under the table. Note: Candidates can submit the fees via a Debit card, credit card, Challan, Net Banking. Here we are mentioning the exam scheme of the Lucknow University. candidates required to go through these scheme as it gives the idea about the time management at the examination. The Lucknow University Exam Pattern is given below under the table. For the Lko Entrance Exam of the UG courses, the question asked from the intermediate level in a various board like UP, CBSE, ISC. The topics which are covered from the subject of the entrance exam syllabus is Physics, chemistry, mathematics, biology, and English. Students can click on the link to get the more details regarding the syllabus. 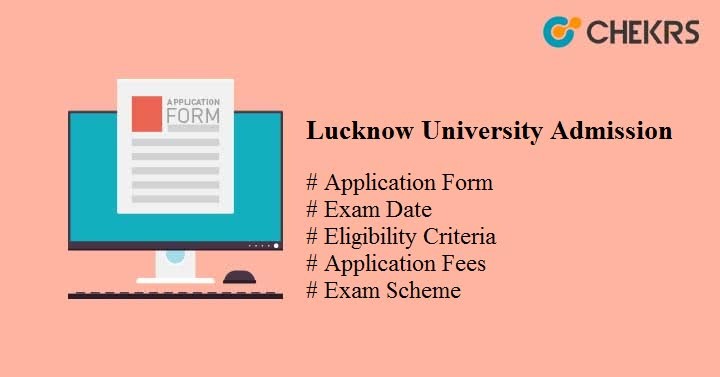 The Lucknow University 2019 Admit Card is the essential document as it is the gateway for the students who want to give the exam. students will soon able to download the admit card from the official website of the university. After giving the exam students are excited to check their answer. Students can check the answer by downloading the answer key from the university official site. The Lucknow University 2019 Answer Key help the candidates to calculate the marks which are marked by the candidates at the exam duration. There are the certain reservation criteria for the candidates according to which the seats are reserved. The details regarding the Lucknow University Reservation criteria is given below under the table. After the completion of all the entrance examination, the Lucknow university declared the result. The university declared the result through the online mode on the official portal of the university. Candidates can check the Lucknow University 2019 Result from the official website of the university. The university releases the cut-off through the online mode in the pdf format as per the courses and the category. The university releases the cut off as per the category-wise i.e. Gen, ST, SC, and the OBC. The Lucknow University Cut Off is released on the official website of the university. The final procedure for the admission in the Lucknow University is the counseling. The Lucknow University 2019 Counselling will start from the June last week (for UG) and 2nd week of July (for PG). the whole counseling will be organized through the offline mode.